Fats are an important part of your diet. They’re a good source of energy and are essential for good health. However, eating too much of certain kinds of fat can be unhealthy so it’s important to find a healthy balance in the fats you eat. Your body needs some fat to absorb certain vitamins that are important for your health – such as vitamins A and D. Some fats are used by your body to make the outer membranes of cells, and some are used to make hormones and other important body chemicals. Some fats with vital functions in your body have to come from your diet because your body can’t make them. These are called essential fatty acids and include omega-3. They’re important because they can help to keep your heart healthy. Fat is a good energy source – it gives you more than twice the energy as the same amount of protein or carbohydrate. But this means you need to be careful about how much of it you eat. If you eat too much fat you’ll probably put on weight. Being overweight or obese means you’re more likely to get some serious long-term health problems, such as type 2 diabetes and high blood pressure. Smarter living. It’s in your DNA. Fats are an important part of your diet because they provide energy and vitamins. There are three different types of fat and each of these can have a different effect on your health. Eating too much saturated fat may increase your levels of bad low density lipoprotein (LDL) cholesterol. Saturated fat is found in fatty and processed foods including some meats such as sausages, full-fat dairy products, butter, ghee and lard. They're also found in pastries, cakes and biscuits. Palm oil and coconut oil also contain saturated fat. Eating too much trans fat may be linked with an increased risk of heart disease. Trans fats are found in processed foods such as cake and biscuits. Eating fewer takeaways and less processed food is a good way to reduce the amount of trans fats in your diet. So why not ditch the takeaway tonight and cook from scratch using fresh ingredients? 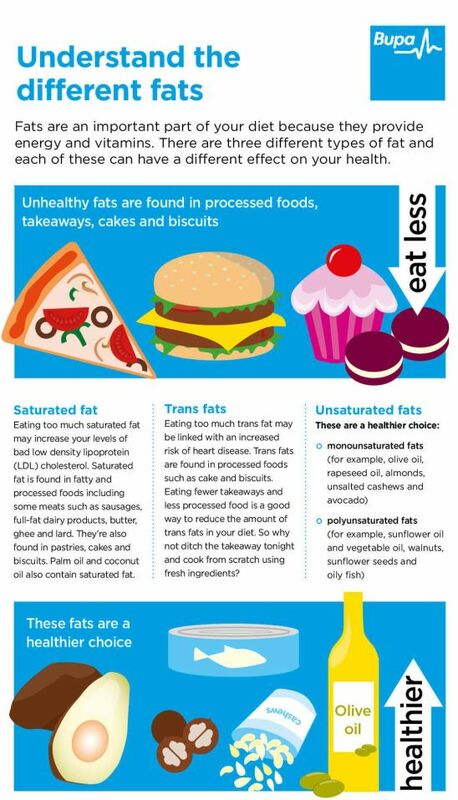 You can click on the image to open a larger version of the 'Understand the different fats' infographic. Making sure you don’t eat too much fat, and eating the right types of fat, is important for two main reasons. It can help you to maintain a healthy weight, and it can lower your risk of developing diseases like type 2 diabetes, stroke and heart disease. Most people in the UK eat more than the recommended amount of fat. Men should have no more than 95g of fat and woman no more than 70g of fat a day. 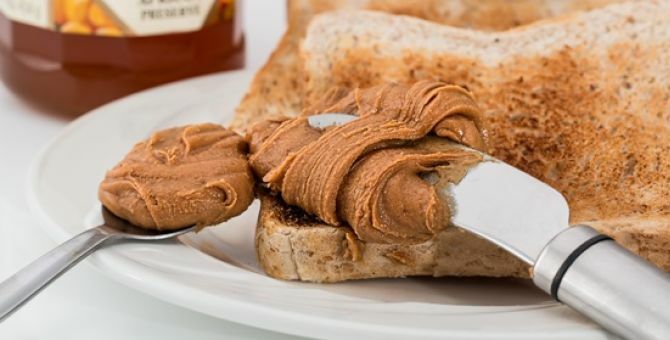 In each case, only about a third of this should be saturated fat – the rest should be unsaturated fat. See ‘Types of fat’ for examples of each. The type of fat you eat, and how much, affects the amount of cholesterol in your blood. You can find out more about this from our information on cholesterol. Eating a lot of saturated fat or trans fat will increase the levels of LDL (bad) cholesterol. This may increase your chance of developing heart disease or having a stroke. Unsaturated fats may lower the level of bad cholesterol and increase the amount of good (HDL) cholesterol in your blood. This may help to protect you from heart disease and stroke. So, when you have foods with fat in them, choosing those with less saturated fat and more unsaturated fat is better for your health. You can see how much fat you’re eating by checking the labels on the foods you eat. The amount of total fat in the food will be listed, along with the amount of saturated fat. Foods that have less than 3g of fat per 100g of food, and less than 1.5g of saturated fat per 100g of food are low-fat foods. Many companies now use a colour-coding system using traffic light colours (red, amber and green) to show the amount of fat, sugar, salt and carbohydrate in a food. The foods with the lowest amount of fat are those with a green colour next to the listing for fat and saturated fat. To find out more, see our information on food labelling. Try these tips to get the right amount and balance of fats in your diet. Opt for foods low in saturated fat. Choose lean meat or alternatives to meat, such as beans, tofu or lentils. If you do have fatty meat, cut off any fat you can see. Use low-fat dairy products such as skimmed milk and reduced-fat cheese. 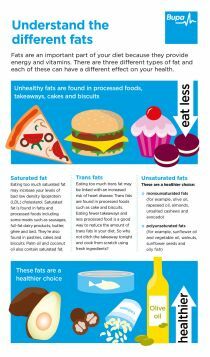 Eat only small amounts of foods that are high in saturated fats or trans fats (see ‘types of fats’ for examples). Choose low-fat ways of cooking, such as grilling, steaming or baking foods. When you do cook with fat, use an unsaturated fat, such as olive oil, sunflower oil or rapeseed oil. Eat two portions of fish each week, including at least one oily fish, such as mackerel or salmon. This will help you get enough omega-3, a type of fat that’s important for good health. If you need a snack, choose a handful of unsalted nuts, rather than biscuits or crisps. You can get lots of tips and hints on eating a healthy balance of fats from the organisations listed below under ‘other helpful websites’. Cholesterol is a type of fat that’s made in your liver.